The Cessna 182 is Capable of reaching speeds up to 60 miles per hour, yet it can fly as slow as 15-20 mph. low and high speed maneuverability. The Cessna 182 Pro Series ships with a 1300 mah Lipoly 7.4v volt rated at 20C that provides up to 20 minutes of solid run time!! Included is long range 2.4 Ghz 4 channel radio for glitch free flying with a range of up to 4000 feet. Benefits of 2.4 Ghz radios are that they have unlimited channel selectivity with ZERO chance of any interference at all. Main wing uses 2 dedicated 9 gram aileron servos (1 for each aileron) for more precise control and quicker turning response times. 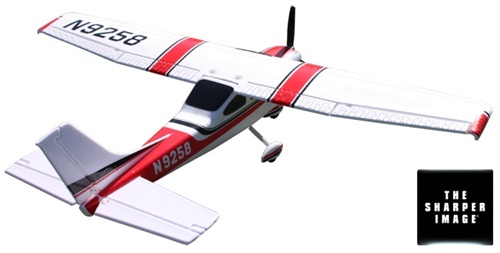 The Cessna 182 is a true scale ready to fly electric powered 4 channel R/C aircraft. Months of flight testing and design yield an aircraft that is super stable and capable of maintaining flight at super slow speeds that allow novice to master flight mechanics with ease. Designed with the novice in mind, its easy fix due to the modular design foam body components. The Cessna Pro Series offers full 4 Channel control: Throttle, Ailerons, Rudder, and Elevator for full R/C flight realism and control. Each radio has trim tabs for precise control surface tuning at the field. All electronic components and decals are pre-installed from our factory. All of our planes comes with a quality control rating card to ensure you receive a working model. Video Instructional SETUP Guide is included with each kit. 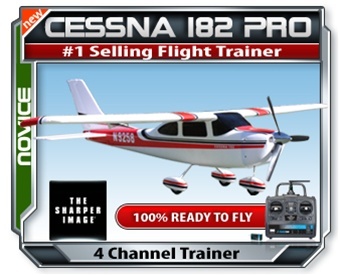 Its a simple step by step guide to ensure that your Cessna 182 Pro Series is setup right from the start.